Gonzo is built with semantic HTML5/CSS3 and is completely responsive. Not only is it responsive but it also keeps that magazine feel right down to mobile screen sizes. Practically every typographic element has been endlessly tweaked for different screen sizes to make sure it looks great no matter what the device. There are two main styles of blogroll. On top of that are five different layout modules that you can pick and choose between for more complex layouts. Clear and sensible spacing, combined with good hierarchy will ensure that even the fustiest troglodyte will have no problem navigating your blog. Legibility and accessibility should be of major concern when choosing a magazine theme and Gonzo does not disappoint. Clear typographic hierarchy and cross-device compatibility will ensure that not only will you reach more people, those same people won’t have to squint or mess around with the zoom on their mobile devices. 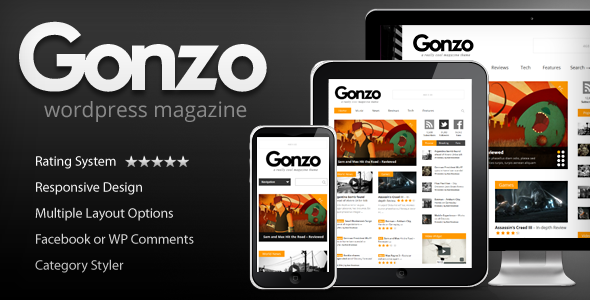 Share the post "Gonzo – Clean Responsive WP Magazine"